Yes, the #bakingtrio has gathered once again for some fun X'mas baking! 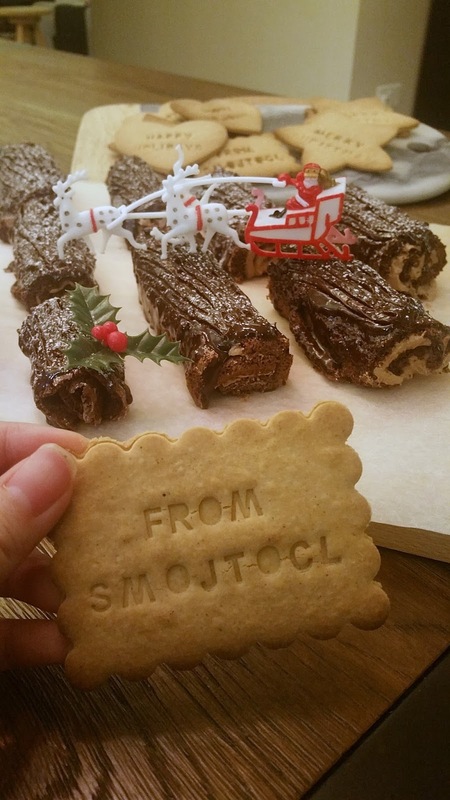 In case you're wondering what's Smojtocl, it's actually SM . JT . CL (our initials). 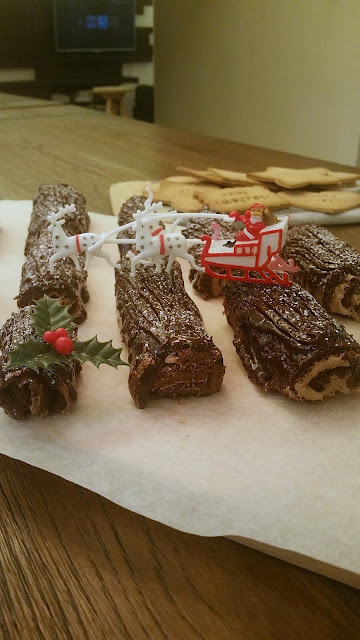 Anyhow, let's start off with the more interesting one, the mini yule logs! 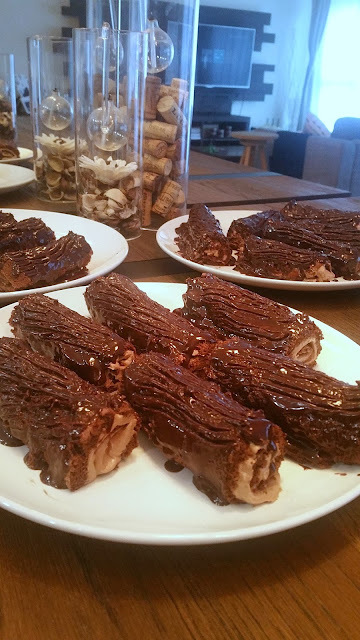 We followed CupcakeJemma's recipe, but made some tiny changes here and there to bring you 16 (actually it's 15 and a half) mini chocolate log cakes! note: 1 batch gives you 8 mini logs and we baked 2 batches because we've only 1 tray. First, separate the yolks from the egg whites and beaten the egg whites (preferably with a mixer) until it gets frothy. Add in 25g of caster sugar in 3 additions, beating the egg whites till stiff peaks are formed. Be sure to not get any egg yolk in your egg whites, just a tiny drop of yolk is enough for your meringue to NOT form! In another bowl, mix the yolks and 50g of caster sugar and beat till it turns pale and thick (you may beat the yolks with a mixer stained with meringue but not the other way round!) Then, sift in all your dry ingredients and fold in gently. Then, temper your egg yolk mixture with about 1/3 of your meringue (just add in the meringue and stir to loosen up the yolk mixture) before adding all the rest of the meringue in and fold until they're JUST combined. DO NOT overmix as it will deflate your meringue too much and you won't get a nice sponge. May I also suggest that you do the mixing lightly with a hand-whisk instead of folding with a spatula if you're not that confident with your folding skills. Then, pour the cake mixture into your lined baking tray and level them out gently with a spatula. Make sure they're as leveled as possible so as to not get holes in your sponge cake! Bake the cake at 180 degree Celsius for 10 - 12 minutes (depending on your oven) or until the top of the cake bounces back nicely when pressed down lightly. When the cake has cooled down a little, turn it out and gently peel off the parchment paper before leaving it to cool completely. Do cover it with a clean tea towel to prevent the sponge cake from drying out. It won't take that long for it to dry out as it's extremely thin. First, melt your chocolate over a bowl of hot/simmering water. Make sure your chocolate bowl does not touch the simmering water if not your chocolate may burn! Then, beat the soften butter with icing sugar until it turns pale and fluffy (you may want to check if the buttercream is ready by rubbing some between your fingers to make sure it's not longer grainy). Add in the melted chocolate and alcohol and beat until it's well combined. Then, spread your buttercream onto the sponge before cutting them up into 8 slices and start rolling! It doesn't matter that your sponge is cracking at the surfaces as the chocolate ganache will save you. Just make sure that your mini roll cakes are able to stay together as a roll, that's all you need to focus on. Heat up your whipping cream in a pot until it just starts bubbling (simmering, not boiling) and pour the hot cream over your chocolate. Let it sit for a minute before stirring at the mixture until all the chocolate has melted. 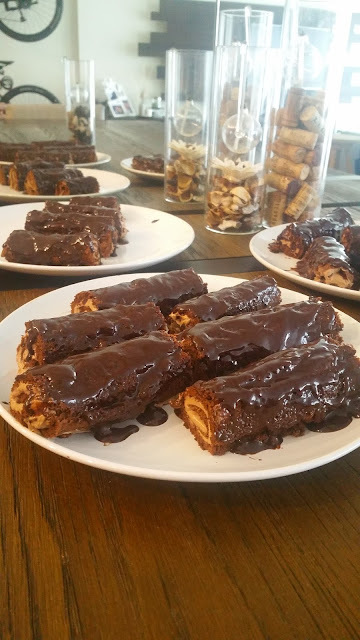 After all your logs are generously covered with the ganache, wait for it to set before using a fork to draw out the grooves of the log. So you'll end up with these! 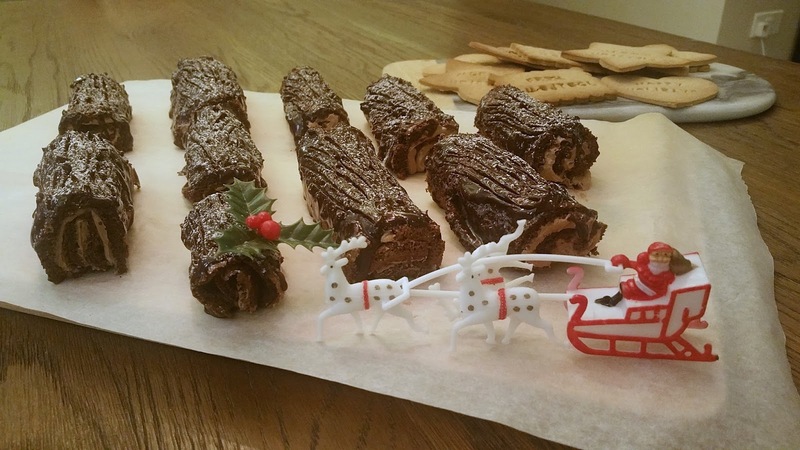 Your mini yule logs are done! And well, realising that we still have time we decided to give gingerbread cookies another go (we ended up with gingerFAT man last year). After a quick recipe search online, we agreed to work with Jamie Oliver's easy and fuss-free gingerbread cookies recipe. In a point, melted the butter together with the sugar and maple syrup and stir until all the sugar dissolves. Then, add the mixure to the dry ingredients and mix until it all comes together to form a dough ball. 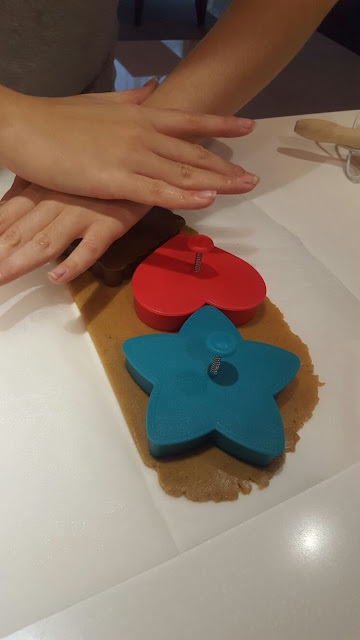 Roll your dough out to 5mm thickness and start cutting out your cookies into any shape(s) you fancy! There's no need to chill the dough before rolling it out as it's a really easy dough to work with, soft and malleable, yet not sticky. Do work fast though, because it dries our pretty quickly and soon it all turned into a mixture that resembles more of moist sand. But if you really wish to save your dried out dough, just add in some more water, knead, and re-roll. And the main reason why we decided to bake the cookies was to try out J's new toy. Cookie cutter that allows you to print out messages on the cookies! The cookies are crisp and crunchy throughout instead of being the soft, bread-ish kind of cookies, which I really like! But J was thoroughly disappointed because she would very much prefer having a soft, bready cookie instead. And to end off this post, I shall show you one more picture of our awesome mini yule logs! Oh my! You had me crave for yule logs and gingerbread cookies at 2 in the morning. Haha! Thank you for sharing your recipes. I will give this a try on Christmas day when I go visit my parents. I'll probably make a bigger version of the yule logs though so it won't require too much work on my end. I think I can use my bento tools to cut the cookie dough so all is well. Those cookies and logs are goals! I've only tried the easy bake cookies wherein you'll just add water. I have baked cupcakes, brownies, and cookies but not these Yuletide goodies. I'm bookmarking this so I could try making this at home! They look really nice and yummy, Mia. I think for cookies, I have to agree with J. I like my cookies soft too. But hey, it's not like they are full meals, but more like snacks so it's okay. Oh em gee, they look like logs indeed! How very cute. I don't really bake but I'm curious as to how this one tastes. It looks like the perfect thing to serve this Holidays. they taste wonderful! cupcake jemma really has good recipes that are easy to follow too! just cut down on those sugars.... i feel western bakes are still too sweet for a normal asian's tastebuds. Those logs goodies looks so yummy! 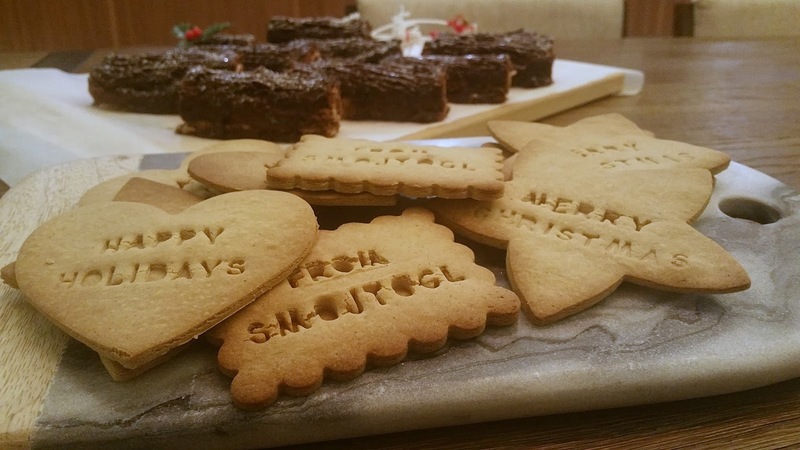 I wonder how to put letters on those cookies. I wanted to make gingerbreads too but i am always too lazy to mix and wait for the oven to finish the baking. I wanted to eat instead! These are perfect for the holidays! Yummy! I remember those logs from something I have eaten before. It's like demolino chocolate but I am so sure. That was long time ago already. Your baking skills are great! 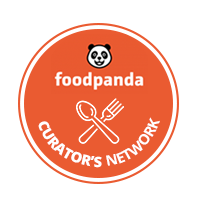 Keep it up and keep sharing good food recipes! Wow, I remember when my friend ask me to take some short course on how to bake, I refused. I should have accepted the opportunity. Anyway your cookies and Mini Yule logs are really cute and seemed tempting by just staring at them. I hope to try it if given a chance. I don't really bake since we don't have an oven at home. However, I found it interesting to look at your output. You enhanced an existing recipe and made sure to make it your own by even putting your initials. It's great! Wish I could try how it tastes like. The yule logs look like so much fun to make. It surely came out festive. I miss gingerbread cookies. I haven't had that in a long time. I'll try and get my daughter (baker of the family) to use your recipe!